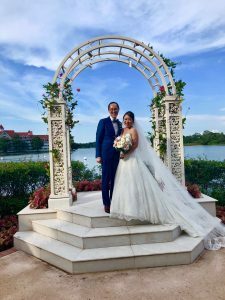 Katie and Clarence united in marriage at the Walt Disney World Wedding Pavilion in what could only be described as an international affair. From across the globe family and guests gathered to watch as Clarence and Katie recited their wedding vows, exchanged rings, and kissed for the first time as husband and wife. Elise from Disney Fairytale Weddings coordinated every last detail, from Katie’s arrival in Cinderella’s carriage to the bubble and ribbon exit over the bridge. Stephanie Caldwell and Jacob with Disney Fine Art Photography captured every moment of the day. They are truly amazing! David and Kristina from Trinity Wedding Cinema worked with the couple and their vendors to not just capture the moments, but to weave together a video that would tell their love story and the celebration of their love. It would be difficult to express in mere words the reasons why I love Katie Leung. To attempt to do so would be akin to expressing the majesty of the towering Rockies with a poorly sung nursery rhyme, or to convey the sonorous complexity of a Brahms symphony with a hastily drawn sketched caricature. The myriad different ways she is special to me are an interplay of who she is, and what she has inspired within me to be. Not only is she beautiful, smart, charming – and when she wants to be, perhaps a little graceful – when we are together, we bring out the best in each other. When I yearn to be meek, she strives to be firm. When she seeks to be resolute, I preach temperance. When I move to impulse, she pauses to reflect. And when we both strive to better both ourselves, and the world around us, we do so as one. This, crudely expressed, is why I love Katie Leung – she is my muse, my conscience, my true North, and above all, my best friend and companion. She is the reason why I am a better person; and I have reason to believe that she feels the same about me! Here is what Katie wrote: To describe Clarence, most people might use “intelligent”, “nice”, or “kind,”, but to me, he is everything of that and more. We love to laugh and be silly together; we love to travel the world to explore a new culture and take in beautiful sights; we also love to learn from each other – open to see the world a little differently from others’ perspective. Clarence is also an optimist – he sees the good in people and believes in second chances despite growing up in an environment that taught him otherwise. But most importantly, Clarence and I share a lot of common values and have the same outlook in life – we see life as a journey and value each other as a true partner and teammate. We make decisions that based on best for both of us, instead of just one of us. We value each other’s strength and weaknesses and somehow it magically turns out to complement each other. I trust him completely and know that I can rely on him at my time of needs, or share my happiness during a time of excitement. And thus I trust and commit, to love him for the rest of my life. What a wonderful celebration of their love for one another.